SterileWipe wipers are gamma irradiated to a 10-6 sterility assurance level. Each sterile wiper shipment is accompanied by lot-specific Certificates of Processing and Compliance. Expiration dates are marked on each bag. SterileWipe™ wipers are available in several substrates, both dry and pre-wetted. 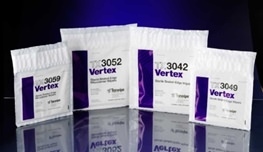 Small-lot packaging in solvent-safe bags provides superior sterility and usage control. Sterile 70% Isopropanol, when applied with the appropriate wiper substrate, is effective for one-step cleaning of relatively clean surfaces and is excellent for the final rinsing and residue removal step of many critical cleaning protocols. SterileWipe wipers are gamma irradiated to a 10-6 sterility assurance level. Each sterile wiper shipment is accompanied by lot specific Certificates of Processing and Compliance. Expiration dates are marked on each bag. Texwipe sterile wipers are ideal for cleaning pharmaceutical aseptic fill areas, biotechnology manufacturing facilities, microbiological labs and sterile suites.